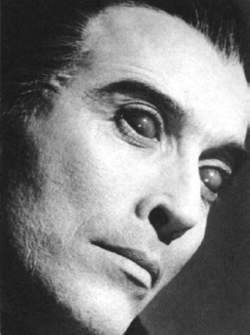 When Lucy Westenra was attacked by Dracula, he had blood-red eyes, much like Christopher Lee has in this photo. Werewolves and vampires have often been linked in the movies. Here, a female vampire prepares to bite her victim in the film Return of the Werewolf. Lon Chaney, Jr. as a werewolf in The Wolf Man. The werewolf is one of several monsters closely associated in the public mind with the vampire. That relationship was largely established in the 1930s with the production of two werewolf movies by Universal Pictures and the inclusion of the werewolf and the vampire together in three monster mash films during the 1940s. By definition, the werewolf is a human being who at various times (usually at the full moon), either voluntarily or involuntarily, changes into a wolf or wolflike creature and assumes many of the characteristics of the wolf, especially its viciousness. There is also a disease, lycanthropy, in which people believe that they change into a werewolf when in fact they do not. Origin of the Werewolf: Like the vampire, and unlike Frankenstein’s monster, the werewolf was an ancient figure found in the folklore of people worldwide. The oldest report of a man changing into a wolf was from ancient Greek mythology. Lycaon (hence the word lycanthropy) displeased Zeus and the deity changed him into a wolf. However, a number of ancient writers such as Galen and Virgil provided the first descriptions of lycanthropy. They rejected the mythology and believed that the change into animals was a diseased condition brought on by melancholia or drugs. In like measure, werewolfism has been reported throughout the world, though the type of animals into which humans transform has been quite varied, including lions, tigers, jaguars, hyenas, sharks, and crocodiles—all animals that are large and known for their ferocity. Contemporary reports of lycanthropy also come from around the world, both in rural areas and in the modern West. Some contemporary cases are included in the selection of papers compiled by Richard Noll. Werewolves and Vampires: Werewolves and vampires have been reported as existing side by side in the mythologies of many cultures, but they have a special relationship in the southern Balkan area, from where much of the modern vampire myth comes. That relationship was particularly evident in the use of the term vrykolakas (and cognate terms in various Slavic languages) to describe vampires in recent centuries in Greece. In accounts of the vrykolakas in southern Balkan countries, there was some confusion over the word’s meaning. In the early twentieth century, pioneer researcher Freidrich Krauss, working in Bosnia, concluded that the vrykolakas (spelled vukodlak in Bosnia) was a werewolf (i.e., a man or woman who changed into a wolf and attacked the local cattle). More recent researchers such as Harry Senn and Jan L. Perkowski have argued that the word vrykolakas derived from an old Slavic word that referred to the ritual wearing of wolf pelts among Slavic tribes during the first millennium C.E. Earlier, Mircea Eliade had observed that the Dacians, the people who previously resided in what is present-day Romania and whose name means wolf, ritually transformed their young warriors into wolves by dressing them in wolf pelts and engaging in appropriate mimicking behavior. The historian Herodotus had described such behavior among the early people of the southern Balkans. At the time the wolf was admired as a warrior animal. Senn noted that during the early centuries of the second millennium the perceived role of the wolf changed from one that was admired to one that was feared. The wolf became a threat to the community because it attacked livestock and people. which time vrykolakas had began to refer to vampires. That meaning then spread throughout the southern Balkans and into Greece. Perkowski even has argued that the term never referred to a werewolf, as Krauss and others have suggested. Among modern Romanians there is a were-creature, the tricolici (or pricolici), a man who may take the form of a pig, a dog, or, less often, a wolf. Belief in werewolves apparently peaked in Europe during the late Middle Ages. While many refused to believe that actual werewolves existed, many believed that lycanthropy was caused by the devil. The original witchhunters, James Sprenger and Heinrich Kramer, the authors of the 1486 volume The Witches Hammer that started the great witchhunts of the next two centuries, declared the transformation of man into wolf impossible. But they believed that witches and sorcerers could cause another person to believe that he had been transformed into a wolf. There were, however, several trials against people accused of werewolfism. The Werewolf in Literature: The werewolf made a number of brief appearances in literature as early as the fourteenth century, but it was not until the middle of the nineteenth century that the appearance of three werewolf novels within a few years of each other injected the creature into the public consciousness. Hughes the Wer-wolf by Sutherland Menzies was, like Varney the Vampyre, published as a weekly serial over a period of time in the 1850s. Then, in 1857, The Wolf-Leader and George W. M. Reynold’s Wagner the Wehrwolf (another weekly serial) were published. The latter volume usually is looked upon as the fountainhead of modern tales of the werewolf. A number of werewolf short stories and novels appeared over the next 80 years but attracted little attention until 1934, when Guy Endore’s The Werewolf of Paris was published. Endore had been a screenwriter in Hollywood and had worked on several horror movies, including The Mark of the Vampire. His book received enough acclaim that Universal Pictures decided to produce its cinematic version. Changing the location slightly, the first werewolf movie appeared in 1935 as The Werewolf of London. Endore’s tale told the story of Bertrand Caillet, whose mother had been seduced by a priest, Father Pitamont. The strange child grew up and became a werewolf, a fact discovered when he was wounded by a bullet made of silver. (This old remedy derived from the belief that silver should be used when shooting at Scottish witches who had transformed into an animal form, such as a rabbit. From Endore’s use, the silver bullet would become part of the conventional wisdom concerning werewolves.) As Bertrand grew, the violence caused by his wolfish nature could no longer be checked or covered up. He fled from the countryside to Paris and there enlisted in the French Army in time for the Franco-Prussian War. His nature was soon revealed, however, and he met his end following a court-martial. Endore’s werewolf Bertrand was based in large part on the factual case of François Bertrand, a French noncommissioned officer who in 1848 was convicted of breaking into a number of graves in Paris. In the stories about him, Bertrand was generally referred to as a ghoul rather than a werewolf. 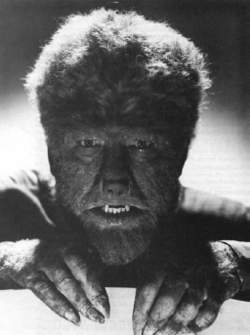 The Werewolf of London was followed by The Wolf Man, the title role being played by Lon Chaney, Jr., who as Larry Talbot mixed the sympathetic and horrific nature of the werewolf character. The werewolf was a man afflicted by his condition, and he fought against it fiercely, even as he attacked living beings when his wolf nature emerged. The vampire and the werewolf seem to have been brought together on the screen for the first time in The Return of the Vampire (1943), the film Bela Lugosi made for Columbia Pictures. Universal brought the vampire (Dracula) and the Wolf Man together in three pictures during the 1940s: House of Frankenstein (1944), House of Dracula (1945), and Abbott and Costello Meet Frankenstein (1948). In the first movie Chaney sought a cure for his condition, which he finally found in the second. In the last movie, played just for fun, the Wolf Man joined the comedic team to prevent Dracula (Bela Lugosi) from transplanting Costello’s brain into Frankenstein’s monster. Other werewolf films followed, though they never gained the popularity of the vampire movies. Hammer Films made one werewolf picture, The Curse of the Werewolf (1961), directed by Terence Fisher, who had worked on The Horror of Dracula several years earlier. Hammer, unlike Universal, never attempted to bring Dracula and the werewolf together in the same story. On television, the two creatures were brought together on the Dark Shadows series when a new character, Quentin, was introduced. As his story unfolded, he was cursed to become a werewolf, his first transformation occurring in episode 752. At first Quentin and Barnabas Collins, the vampire character, were enemies, and they tried to eliminate each other. However, they eventually came to an understanding that they were similarly afflicted, and they then worked together. The next attempt to mix the two characters came in 1970 with The Werewolf vs. Vampire Woman, one of a series of werewolf pictures starring Paul Naschy as Count Waldemar Daninsky (the werewolf), who was countered in this film by the vampire/witch Countess Waldessa. A vampire appeared in the fifth sequel to Howling (a series of werewolf movies). In Howling VI: The Freaks (1990), the vampire kidnapped the werewolf to serve as an attraction in his traveling freak show. A werewolf-like theme also was evident in Dracula’s Dog (1977), a story about a vampire dog unleashed on Los Angeles. The werewolf theme has shown continued appeal, though not to the extent of the vampire. It has been the subject of a few very fine books and movies, Cat People and Wolfen being perhaps the most notable. It has, however, never developed the popular subculture following of Dracula and his vampire kin. It began to experience a revival in paranormal romance literature in the late 1990s, but awaited the new century to begin to make a real impact. In the first decade of the twenty-first century, the number of new werewolf novels radically increased, almost all of them in the romance genre. And, as the number of both vampire and werewolf novels increased, crossover novels invariably appeared; several writers, most notably Laurell K. Hamilton, created series that, while featuring either vampires or werewolves, included both in the fantasy world of their characters. Carrie Vaughn has, for example, created an appealing werewolf character, Kitty Norville, who regularly faces off against vampires, while Kelley Armstrong has written a set of werewolf novels in which vampires are but one of the supernatural creatures in the background. Keri Arthur has created the popular “Riley Jensen, Guardian” series whose hero is a half vampire/half werewolf, all of which provides the setting for exploring the various attributes of each identity with which Jensen must live. Eventually, the more successful vampire romance authors like MaryJanice Davidson and Charlaine Harris will tend to introduce werewolves into their story lines. Additional romance vampire/werewolf crossover novels have also been written by Angela Knight, Emma Holly, Morgan Hawke, Patricia Briggs, Raven Hart, and Melina Morel. Getting vampires and werewolves together romantically can be traced to the horror comic books of the 1950s. The relationship was approached on television with the werewolf Oz who was a character for several seasons on Buffy the Vampire Slayer, though he developed a romantic attachment to Buffy’s friend and resident witch Willow, rather than a vampire. The relationship was touched upon again in the BBC series Being Human, which had a vampire, a werewolf, and a ghost living together, though not romantically involved. The werewolf-vampire relationship really blossomed in the movies with the “Underworld” trilogy, originally billed as a Romeo and Juliet story of star-crossed lovers. The Lycans and the vampires are engaged in a centuries-long continual war with each other; though, as one learns through the several movies, the two are related by a common ancestry, and their current hostile relationship was manufactured for personal reasons by the evil vampire Victor. The love triangle created between Bella Swan and her two would be lovers, the vampire Edward Cullen and the werewolf Jacob Black, serves as the major driving force of The Twilight series of novels by Stephenie Meyer. The Cullens are a family of good guy vampires who have a treaty with the werewolves on the adjacent Native American reservation of the Quileute tribe. The outwardly peaceful but emotionally hostile relationship between the two groups is heated up when Edward and Jacob both fall in love with Bella, and their treaty put to the test when it becomes clear that Bella is going to be killed so she can become a vampire. Briggs, Patricia. Moon Called. New York: Ace Books, 2006. 288 pp. Cooper, Basil. The Werewolf in Legend, Fact and Art. New York: St. Martin’s Press, 1977. 240 pp. Cox, Greg. Underworld. New York: Pocket Star Books, 2003. 372 pp. Douglas, Adam. The Beast Within: Man, Myths and Werewolves. London: Orion, 1993. 294 pp. Hamilton, Laurell K. Guilty Pleasures. New York: Ace Books, 1993. 265 pp. Hawke, Morgan. Kiss of the Wolf. New York: Aphrodisia, 2007. 304 pp. Holly, Emma. Catching Midnight. New York: Berkley Sensation, 2005. 323 pp. Jones, Stephen. The Illustrated Vampire Movie Guide. London: Titan Books, 1993. 144 pp. Meyer, Stephenie. Twilight. Boston: Little, Brown Young Readers, 2005. 512 pp. Morel. Molina. Devour. Signet Eclipse: New York, 2007. 336 pp. Murgoci, Agnes. “The Vampire in Romania.” Folklore 37 (1926): 320–49. Noll, Richard. Vampires, Werewolves, and Demons: Twentieth-Century Reports in the Psychiatric Literature. New York: Brunner/Mazel, 1992. 243 pp. Perkowski, Jan L. The Darkling: A Treatise on Slavic Vampirism. Columbus, OH: Slavica Publishers, 1989. 174 pp. Scarm, Arthur N. The Werewolf vs. Vampire Woman. Beverly Hills, CA: Guild-Hartsford Publishing Co., 1972. 190 pp. Senn, Harry A. Werewolf and Vampire in Romania. New York: Columbia University Press, 1982. 148 pp. Summers, Montague. The Werewolf. 1933. Rept. New York: Bell Publishing Company, 1966. 307 pp. 7 Underworld (2003) WEREWOLVES and vampires battle it out for victory with Kate Beckinsale caught up in the middle of it all as the undead fighter falling in love with the wrong man. This gripping supernatural drama returns for a fourth series, packed with more action from ghosts, werewolves and vampires. We've got werewolves and vampires fully involved now. Subtitled Rise Of The Lycans, this origin story for the war between werewolves and vampires is a stylish action thriller with nods to the horror genre rather than an actual scary movie. One group of diseases, the porphyrias, are thought to be the basis for stories about zombies, werewolves and vampires. Getting teeth into new courses!